X MARKS THE SPOT: You don't have to sail the seven seas or dig deep to find great music. 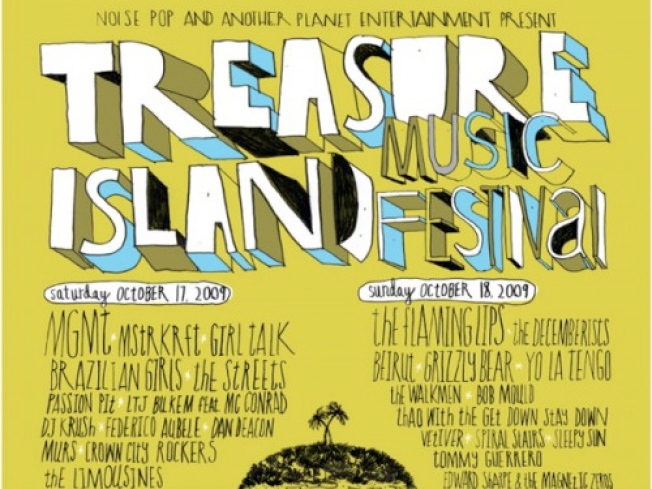 Starting Friday enjoy two days chock full of amazing concerts at the Treasure Island Music Festival. This year's lineup includes MGMT, Girl Talk, The Walkmen and MSTRKRFT, just to name a few. CURRY ME HOME: Thai curry, Japanese curry, Indian curry, Jamaican curry. There are so many delicious curries of the world, New Delhi restaurant wants to help you keep track of them all. This Friday at 5 p.m. come to Curries of the World: History & Tasting, hosted by chef Ranjan Dey. JUST GOT PAID: But that doesn't matter because tonight's events at the De Young Museum are free! Listen to jazz by Howard Wiley and the Angola Project, make your own paintings with "art diva" Kim Erickson, and get temporarily tatted up in gorgeous Henna. YO LA TENGO: Everyone loves a good Sunday Brunch and you're about to love it even more. Drop by Aquarius Records for an intimate in-store session with Yo La Tengo. Wind down with the band and tell them how much you loved their Saturday performance at Treasure Island.